The British Eighth Army was one of the early sets to be produced by Airfix, back in the early 1960s, and it was a popular subject as during the War, still easily remembered at the time, it was the campaign in the desert that provided the main means of fighting Nazi Germany since no British troops were on continental Europe. The fame of the Eighth Army was assured as a result, and while the figure set was not one of the more popular in some export markets, where the relevance was much less, it did well enough for them to produce a second version of much better quality in the 1970s. 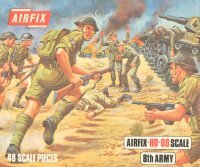 For our review of the first type see Airfix 8th Army - First Type, but it is the second type, which we discuss here, that would be in most Airfix catalogues for the following decades. At 14 poses there are somewhat fewer than the type 1 set, but it is clear that the designer started with a clean sheet and made no attempt to merely upgrade the old poses, as was done with the French Foreign Legion. Though all the standard positions are here, they have been realised with real skill. The men really lean into their activities, and there is lots of movement about every one. With the difficulties of undercutting inherent in prone figures, this set includes only one, but he is superb, showing just what can be achieved with a little thought. The only pose we felt uncomfortable with was the man thrusting down with his bayonet. Hand-to-hand fighting was rare in World War II, and in any case this figure doesn't really convey the act of bayoneting. The uniform conforms to the appearance most people associate with these troops, with khaki shirt, shorts and standard British steel helmet. In reality a real medley of clothing was worn as befitted the situation, not least because of the very cold nights in the desert. Therefore this uniform look is authentic but not particularly representative of the whole range of costume these men wore. Still it has been correctly represented, and for many these figures capture their image of the Eighth Army perfectly. All the weaponry is accurately done except the large .303 Vickers Medium machine gun, which is a lovely model but lacks the water condenser. One man holds a Thompson submachine gun, which is correct although it is unusually the older type with the forward pistol grip. Another man holds what looks like an early Sten, which is also OK, but while we liked the crawling man with the Bren, that would be a tricky weapon to handle this way, and we would have liked to see a Bren in action too. Personal kit is all correct, including the 37-pattern webbing, though some men lack bayonet holders, even though they are sporting a bayonet on their rifle. The man with the mine-detector is a great inclusion, though he only has the pole - lacking the associated controller, battery, wires and headphones which would be necessary to actually use it. Although anything would seem good compared to the quality of the sculpting of the first set, this second type is beautiful by any standards, with plenty of detail and realistic-looking folds. The detail on the weaponry is excellent, and while the faces may tend to be a bit bland this is still a quality sculpt. It would seem that Airfix used the masters for their 1/32 scale set as the basis for this one, and added a few extra poses to bring it up to spec, which helped to keep costs down but provided us with some great figures. With any set this age there will be many variations in the extent of flash, and on our sample there is some flash to remove, though nothing too terrible. This really is a lovely set. A study of period photographs and film or a conversation with a veteran would soon highlight that the reality was much less neat and tidy than these men, even if several of the poses look to be based on photographs taken at the time, but this is nonetheless a very useful set that has seen considerable service over the years and is likely to continue to do so for many more.